I love Spring and summer months as I get to enjoy the outdoors. Right now, with the temperature in the 70’s, it is the time of berries, which I love to use in it my desserts. My days always start with a cup of coffee, and I love to add different flavors of International Delight® creamers to make my cup of coffee to perfection. You can get International Delight® creamers at your local Walmart. I made this No bake chocolate caramel cheesecake mouse with raspberry sauce using International Delight® HERSHEY’S® Chocolate Caramel. I like to use International Delight® creamers in my recipes as an ingredient. As I had made cookies, Popsicle with it, I wanted to try to make no bake chocolate caramel cheese mousse with raspberry sauce with International Delight® HERSHEY’S® Chocolate Caramel. 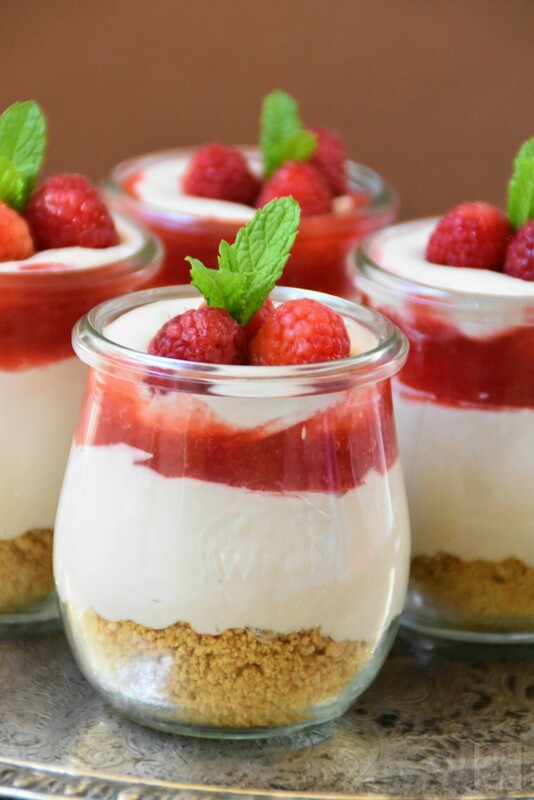 My hubby loves cheesecakes, and he like this Cheesecake mousse too now. 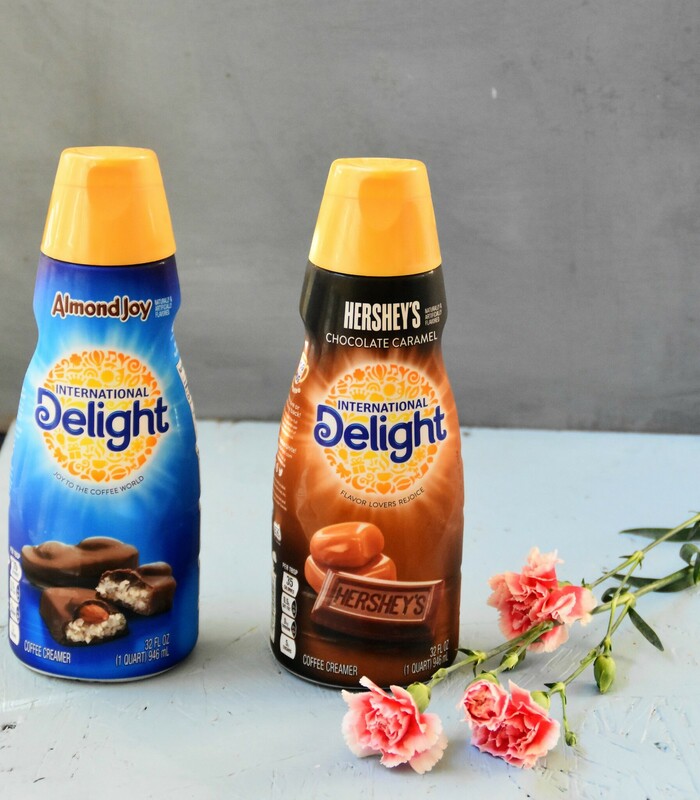 Do you know, three new flavors of International Delight® creamers are now available, one is International Delight® HERSHEY’S® Chocolate Caramel, International Delight® REESE’S® Peanut Butter Cup and International Delight® Almond JoyTM, and all comes in 32 oz size. I bought International Delight® HERSHEY’S® Chocolate Caramel and also International Delight® Almond JoyTM as I like both chocolate caramel and Almond joyTM a lot. You can get your favorite candy in coffee. Check the in-store display that includes a tearpad with a recipe and $0.50 coupon valid in April. You can grab all the ingredients for this recipe from your local Walmart. 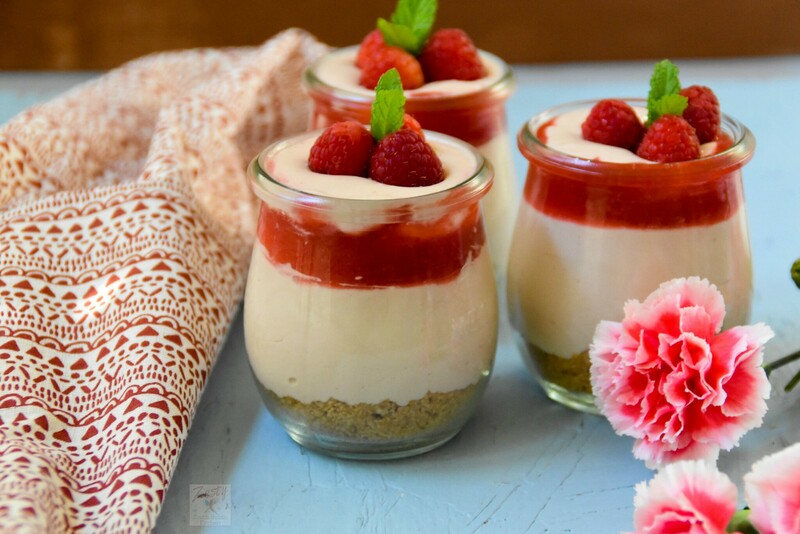 I know cheesecake with raspberry sauce is summer time classic combo, hence I incorporated that concept in the no bake chocolate caramel cheese cake mousse. Also, I made it in a small jar, which not only looks good, but also is of individual serving size. You only need to make raspberry sauce and mousse. Rest is just assembly, you can assemble this no bake chocolate caramel cheesecake mousse with raspberry sauce when you are ready to serve. The International Delight® HERSHEY’S® Chocolate Caramel creamer goes well with cream cheese, cocoa powder and cream to make perfect mousse. If you like thicker version of mousse add gelatin. Once you make the mousse, refrigerate it. Then assemble and serve when you are ready. Chocolate caramel creamer flavor perfectly matches with the tangy cream cheese and raspberry sauce. I served with fresh raspberries. 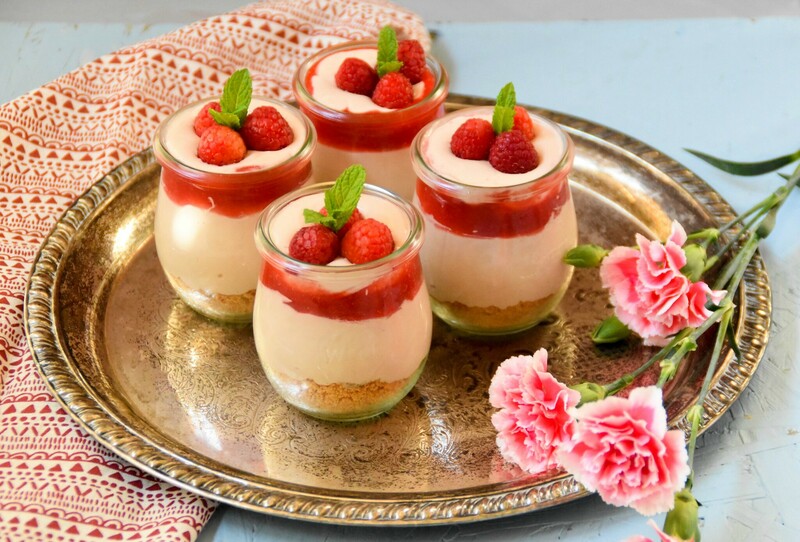 Thus, you can incorporate International Delight® Creamers to not only add to your morning coffee, and to make delicious summer times favorite desserts. 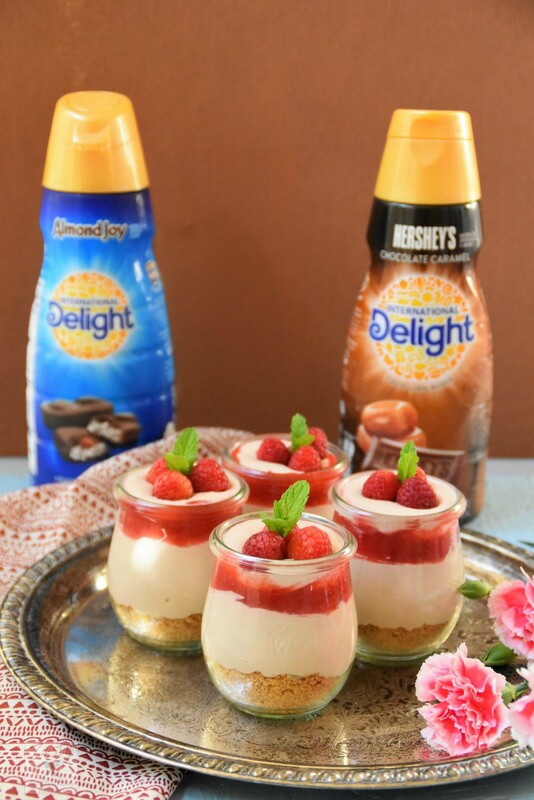 Are you ready to make this no bake chocolate caramel cheesecake mousse with raspberry sauce, then grab International Delight® HERSHEY’S® Chocolate Caramel creamer and enjoy with your favorite summer time activities.Visit this Pinterest page to find recipe inspiration for delicious, seasonal treats. ½ cup International Delight® HERSHEY’S® Chocolate Caramel. In a small saucepan, add granulated sugar and cornstarch, cold water, lime juice and mix well and then add raspberries. Cook over medium heat whisking frequently, until mixture reaches a boil. Stir in between and until raspberry get cooked and sauce has thickened. Remove from heat and force sauce through a fine mesh strainer into a bowl or airtight container. Cover and refrigerate. In a mixing bowl, using an electric hand mixer set on high speed, whip heavy cream until soft peaks form. Then add powdered sugar whip until stiff peaks and set aside. In a separate mixing bowl, using electric hand mixer set on medium-high speed, whip cream cheese until very smooth and fluffy, about 3 minutes. To this add International Delight® HERSHEY’S® Chocolate Caramel creamer and then mix in cocoa powder and vanilla extract. Fold in the whipped cream mixture into the cream cheese mixture until combine. Cover bowl with plastic wrap and refrigerate for 2 hours or up to 8 hours. In a small mixing bowl, whisk together crushed graham crackers and melted butter and light-brown sugar. Using a fork or clean fingertips, blend in everything. Cover bowl and refrigerate until ready to assemble. The almond is our favorite flavor we only buy this kind and love it . I like it in my hot cocoa also! These look absolutely adorable! Love the serving sizes, perfect for portion control. Yum! Oh my goodness this look absolutely amazing! It truly looks delicious! So YUMMY!!! I would love to eat this for breakfast, lunch and dinner! This is absolutely fantastic! Beautiful presentation. So cute!! Thanks for the great recipe! This dessert just screams my name!!!!! i’m a big fan of international delight, so this is right up my ally. Looks so inviting! We love our International Delight! We’ve tried different brands but they just didn’t compare. We hadn’t thought about using them for desserts. I’m already thinking of delicious additions to my breakfast. I love international delight and the flavor of these is just amazing. I am scared to bake a classic cheese cake but this recipe sounds really doable for me as it is a no bake one. I have almost all the ingredients in my pantry. Can’t wait to give it a try. Such a creative recipe! International Delight is always in my refrigerator and I love that you have shown a new way to fall in love with it! And what could be better than chocolate caramel cheesecake mousse???? YUM! This looks so good! Cheesecake recipes must be trending now because I’ve been seeing a lot lately. I would love to sit down with a book and enjoy one of these delicious treats! That looks very pretty swathi! I m checking whether these creamers are available here, an easy way to add flavors to your desserts! Pretty and perfect jars! !